Home | CFS Investment Advisory Services, LLC. As a busy professional or active retiree, you need someone you can trust to manage the assets you've worked so hard to accumulate for your family. You need a financial advisor who offers the experience, independence, and integrity to match your own achievements and goals. CFS Investment Advisory Services LLC (CFS) will help you understand and control your finances and free you to pursue your dreams and aspirations. 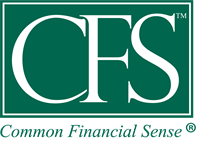 CFS stands for Common Financial Sense, a philosophy that embraces sophistication without complication. You will work with dedicated financial advisors who listen, understand, and care deeply about helping you make your dreams come true. We call it the CFS Standard of Care; you will call it the freedom to enjoy your life without worrying about your finances.